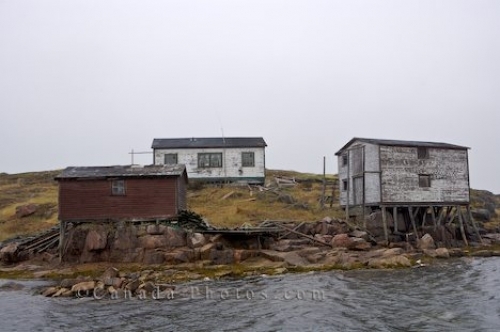 The waterfront scenery of Indian Cove on Great Caribou Island in Southern Labrador, Canada, consists of old, rundown fishing stages. While traveling past Great Caribou Island in Southern Labrador, Canada, a small area known as Indian Cove, provides the waterfront with the scenery of old fishing stages. These fishing stages with faded paint, loose boards and the desire for a little care, have adorned this waterfront for many years. Indian Cove is a very small fishing village and many of the local fishermen still use these fishing stages on a daily basis after coming in off the water. The village on Great Caribou Island is a one street community with no services, stores or luxuries. The fog can linger around the island for some time, but many still love the old rustic look to the waterfront and the scenery surrounding the island once the fog lifts. Picture of old fishing stages creating the waterfront scenery at Indian Cove on Great Caribou Island in Southern Labrador. ... along the waterfront in Indian Cove, Great Caribou Island, Viking Trail, Trails to the Vikings, Southern Labrador, Labrador, Atlantic Ocean, Atlantic Canada, Canada.